Sometime back we wrote about traveling with wine as it’s something of a tricky subject. Wine is a liquid and it comes in very portable albeit very breakable glass bottles and naturally, the wines you find while traveling are more often than not unavailable back home so you want to bring a few back. Thus the article linked to talks about how to pack a suitcase with wine bottles in a proletarian, yet generally effective manner. This system has worked well for us and, knock on wood, we’ve transported hundreds of bottles this way. While wine bottles are quite durable, it’s not a foolproof manner to carry them about though, especially in this day and age when suitcases are packed more heavily on to planes and gone through more thoroughly at airport security. It was even the case when traveling via Tel Aviv airport that they really go through everything and the poor man’s wrapping system was undone by a very thorough security check. Admittedly this could easily happen in the US as well these days so one should be forewarned. 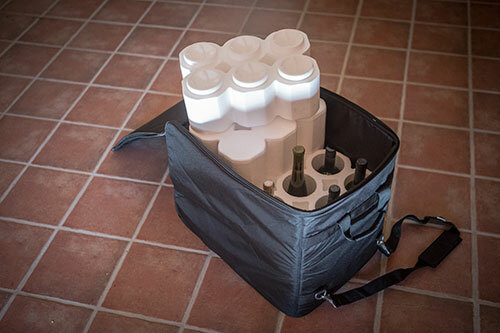 So a little while back we were contacted by Lazenne to try out their wine travel suitcase. They, along with maybe one or two other companies have realized that there is indeed a growing need for this specific type of suitcase and that it can offer up a better option than wrapping bottles in your dirty clothes and prayers. The suitcase that arrived can fit 12 bottles and only that. This is one of the initial considerations of it in that this is a single purpose suitcase meant just to carry wine bottles. If you want a bit more flexibility, you can purchase the foam insulators separately to go in to your normal suitcase which might be the better option for some people, especially as they’ll ship to anywhere in Europe quickly. But the suitcase is a basic, simple design with wheels on one end and a grip handle on the other. Initially, it seemed like it would sit too short for rolling if one is tall, but it turned out to be fine. The main thing though are the bottle protectors inside. They’re quite versatile and can hold all manner and shape of normal 750ml bottles. They won’t hold magnums or champagne bottles, but Lazenne offers a different set of inserts specifically to hold those snugly. In testing it out for carrying around bottles with us, it worked quite well, even for short trips by car where we didn’t want the bottles sloshing all over the place in badly set boxes. Of course, if you do the math, a typical full wine bottle is about 1.2-1.5kg. With a maximum weight of 23kg for checked luggage that means you could in theory take up to 18 bottles instead of “just” 12. But if you’ve ever dragged around a suitcase that approaches maximum weight, you know how painful that can be and 12 is quite reasonable. Again, if you really want to try to carry 18 bottles, get another one of their inserts as they’re quite economic and can be reused many, many times. Overall, a very solid travel accessory. At about 90€, it may seem expensive for suitcase, although the competing, Vin Gard Valise is $280. But, if it stops just one bottle from breaking then it’s a pretty important investment for any traveling wine lover. Great article, traveling with wine is very complicated and for those of us who like to know the wines of different countries this article helps us a lot! Thank you!